This Christmas I was well and truly spoilt when it came to my pressies! As anyone who knows me knows, I love all things make up and beauty related, and my family and boyfriend picked out some gorgeous beauty related gifts for me, so I thought I would share them! First up my mum and dad got me an amazing gift of a years subscription to my favourite magazine, The Make up Artist Magazine!! I was so exited as it is hard to get my hands on a copy, to be honest the time I do get one is when I'm in London , and that's only if Charles fox has it in stock! I am very lucky now to have issues delivered to my door, can't get much better than that!! It is basically the dream magazine for any make up lover, it's filled of info and interviews about the latest make up in tv and film and great tips , as well as class photos of prosthetics and sfx make up! 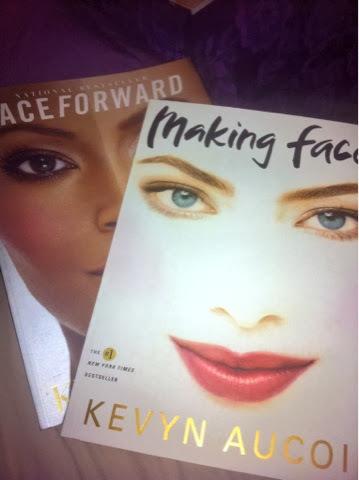 To add to my literary love of all things related to make up, they also got me the amazing books by Kevyn Aucoin, Face Forward & Making Faces. I have wanted and lusted after these books for quite a while and now that I have them they didn't disappoint! These books are filled with stunning images and lots of great ideas and make up tips. I would really recommend these books whether you work in the beauty industry or if your just a make up addict!! They also got me one of my favourite perfumes C.K Shock, I love this perfume as it quite sweet and smells yummy! They also got the mini travel size as well which is perfect for travel or for my handbag. 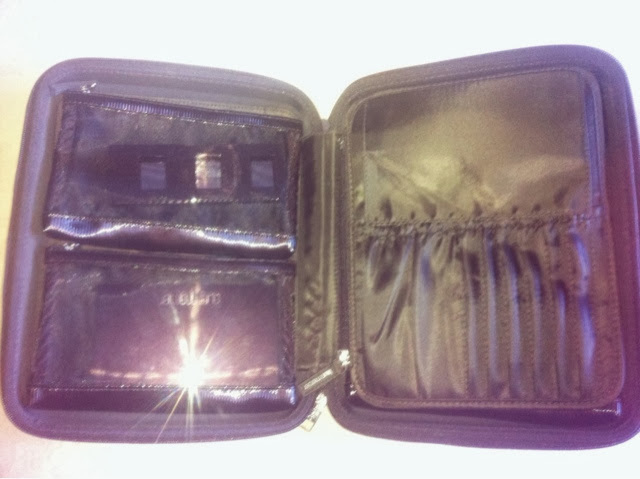 Another addition to my make up kit that is also perfect for my handbag , was the Clinique mini purse lip glosses! I love these glosses as they are long lasting, and it's a great way to try different colours! My boyfriend surprised me with his pick of presents! When we were in London In October I was doing the usual of dragging him about make up counters and shops and blabbing on about brands that I want to try out, anyway he very cleverly and thoughtfully remembered that I had mentioned how much I was wanting to try Burberry cosmetics. 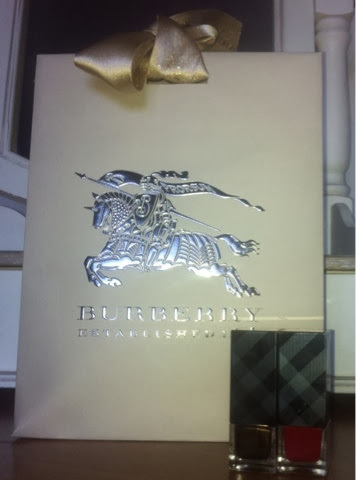 I was then very surprised to open up and find a Burberry gift bag amongst my presents and in it two of the most stunning ,not only in colour but in packaging also, Burberry nail polishes! They almost look too pretty to use , but I'm very excited to try them out! 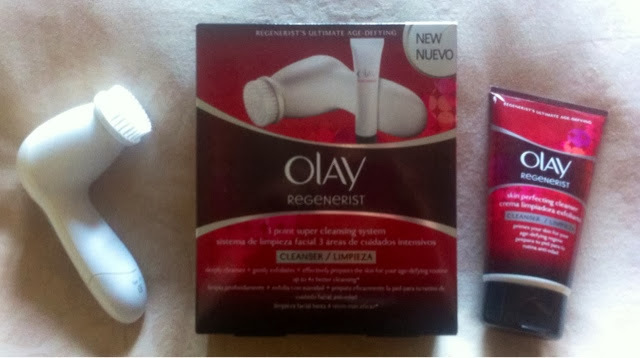 My next present was something that I have been wanting to try for ages, it's the Olay Regenerist cleansing brush. There are so many different cleansing facial brushes on the market, but I had heard really good reviews about this one and it is a good price point. I have only used it a few time since I got it and it is so nice on the skin!! I will be doing a full review of this little gem when I've got using it for a bit longer. I am very excited to have this as part of my skin care routine, here's to good skin in 2014!! Then the last present from Kyle that I opened literally made me freak out on Christmas morning to the point of my sister having to tell me to calm down! 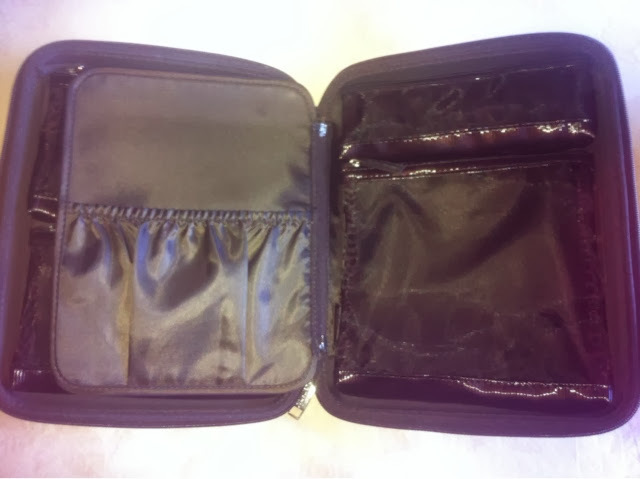 Once again thanks to what appears to be an very good memory, I had told him about the Laura Mercier Custom Artist Portfolio which in my eyes is the most perfect make up bag in existence. It also was launched as a limited edition product ages ago and was no longer available in stores, but Kyle being the amazing boyfriend that he is managed to track me down one!! I nearly died... It is amazing and beautiful... Yes I did say a make up bag was beautiful, but it really is! I'm very excited to use it and think it will be perfect for travel!! Now I have saved this one for last as it isn't an item or object of make up, but my very generous other half also got me tickets to IMATS 2014!!!! Which I am beyond excited about, I absolutely loved IMATS last year and cannot wait to go again :-) Hurry up June !! All of these amazing and thoughtful gifts were far too much! I was very lucky and spoilt! !